A Houlton Public Works Department plow truck cuts into the snowbanks on Pearce Avenue Thursday morning as crews worked to widen many of the town's side streets. Keeping up with the record-setting snow amounts filling the streets and front yards of most homes in southern Aroostook County has proven to be a challenge at times for the Houlton Public Works Department this winter. Like many public works departments throughout Aroostook County, Houlton’s overtime costs are running high, while supplies of salt and sand are starting to get low. On Thursday, the Houlton crew was working to widen some of the busier side streets in town. Some of those roads have narrowed considerably as plows were unable to push the banks back far enough, which can create issues should an emergency response vehicle need to traverse those roads. 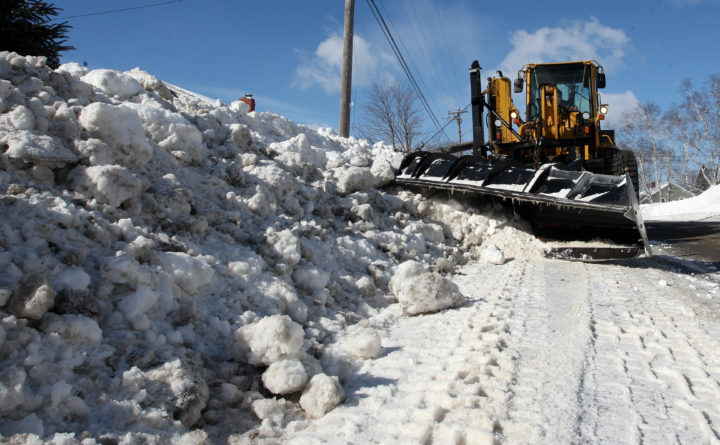 The widening effort involves cutting into the snowbanks found in people’s front yards and then hauling that snow away to the ever-growing drop off spot located on Hillview Avenue. That pile of snow currently resembles a small mountain as the snow from the past four months continues to accumulate. Aside from making the roads wider for better traffic flow, Stewart said the hope is that it will help alleviate runoff in some areas once the melting process begins. “We are trying to get to those streets that we know have issues with water puddling up,” he said. While there have been no major breakdowns of equipment this season, Stewart said some “downtime” for repairs would be most welcomed. “It would be really nice if we could get a week or so to have our mechanics really spend some time on our vehicles for maintenance,” he said.